This game uses a slightly modified version of the The Sims 3 engine and most fixes and some mods for it also work here. 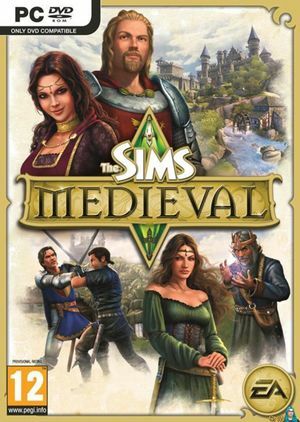 The Sims Medieval Deluxe edition contains both the base game and the Pirates & Nobles DLC. Patch 2.0 is the latest patch available. The patch notes can be found here here. UI does not scale with resolution and is extremely small in 4K. Can be forced through graphics card control panel. Up to 5.1 when zoomed in. Sound effects accompanied by visual effects. ↑ 1.0 1.1 File/folder structure within this directory reflects the path(s) listed for Windows and/or Steam game data (use Wine regedit to access Windows registry paths). Games with Steam Cloud support may store data in ~/.steam/steam/userdata/<user-id>/102820/ in addition to or instead of this directory. The app ID (102820) may differ in some cases. Treat backslashes as forward slashes. See the glossary page for details.